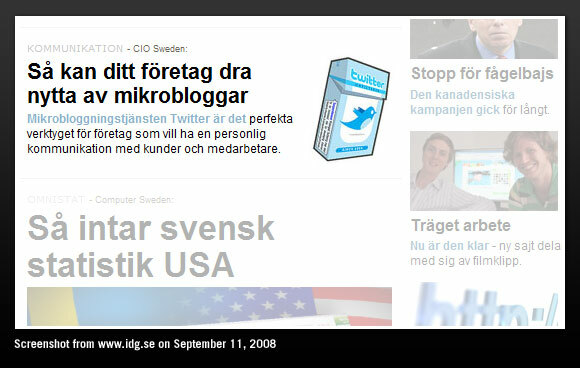 We stumbled upon this very weird picture on the front page of the Swedish IDG News website next to an article about how businesses can promote themselves on Twitter (a partial translation of this article in CIO Magazine). The strange thing is that the image they used is the Twitter logo on what looks like a cigarette pack. What were they thinking? Twitter smokes? We faded out the irrelevant parts slightly to emphasize the relevant article. Update: It IS a cigarette pack. More information in the comments below. uh, i think they mean that twitter is dangerously addictive, like cigarettes. Should’ve gone for the ol’ crack pipe metaphor. Bad buisness. tsk tsk those sweeds sure are buisness killers. I would rather suspect they went for the “twitter is as unhealthy as them thurr cigarettes” approach.